We, citizens from around the EU, call on you to end the push for austerity on Greece, and move to hold a conference to restructure and reduce Greek debt. Austerity has failed to deal with the debt, and devastated Greece’s most vulnerable. We call on you to change course and put people before banks. This week, Greece could be forced to accept grinding and failed austerity policies, or be made to exit the Euro -- causing chaos across Europe. Or we could help create the biggest people-powered push for social democracy ever, and pull this crisis back from the brink! Let’s be clear, behind all the debate and jargon there are only two things we really need to know: 1) the most vulnerable Greek people have borne the brunt of brutal public spending cuts -- 4 in 10 kids live in poverty, infant mortality rate has increased by 43%, and youth unemployment has nearly hit 50%! And 2) it’s been for nothing -- the debt problem has got worse, not better. So more of the same will mean, well, more of the same -- more pain and more debt. 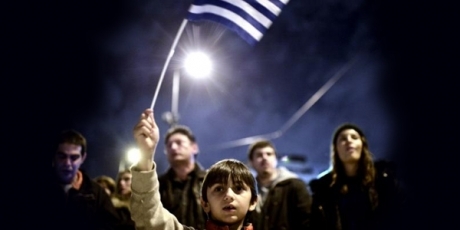 On Sunday, the Greek people voted "NO". Now if enough of us stand with them, we can show our leaders that the public wants to stop inflicting harm and move instead to debt reduction. Sign now -- when enough of us have joined, Avaaz will cover the media with our call.